Timothy O’Toole’s is hosting its own CiderFest this Saturday, June 29 at its Streeterville location at 622 North Fairbanks. The event is from 11 a.m. to 4 p.m. 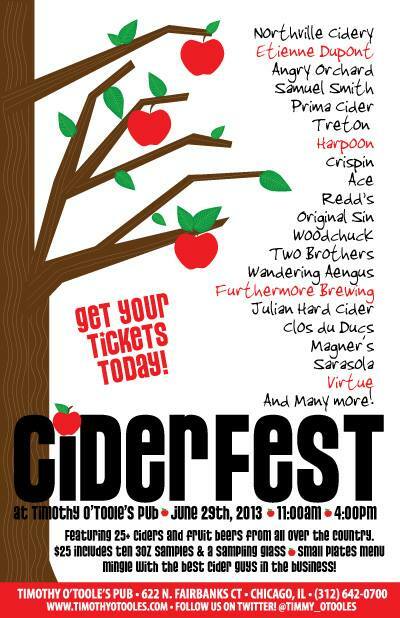 Admission is $25 for a sampling glass, keychain and 10, 3-ounce samples from a selection of over 30 varieties of cider. $25 includes 10 – 3oz samples (two tickets may be used for one 6oz sample), and a sampling glass. Additional tickets may be purchased at $2 per ticket. A cider-friendly small plates menu will be available with menu items ranging from $5 – $12. Cider experts and brand ambassadors will be on hand to speak with customers about the product.